Hardie rubbed at his face. ‘We’ve got two missing girls; an ex-police-officer who was stabbed to death; an exhumed murder victim no one can identify, a serving police officer who’s been hanged, and now you say the body you dug up in the middle of nowhere wasn’t just murdered, it was tortured first!’ He pressed his palms into his eye sockets and made a muffled screaming noise. It is my plan not to read any more of Stuart MacBride’s Logan McRae novels. I bought this one by accident, as I explained a few reviews ago. But it’s not because they’re bad novels. They’re well-written and exciting, with moments of excellent, witty prose. I just don’t like the world they take me into. 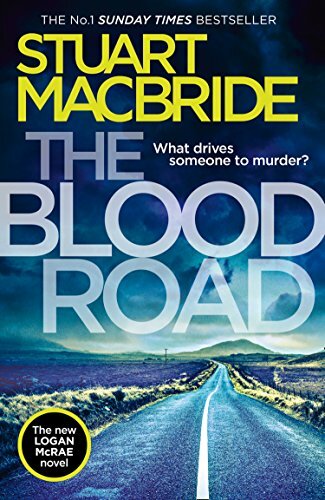 In The Blood Road, our hero, Detective Inspector Logan McRae, has made a move to the Professional Standards police squad in his part of Scotland. His former boss is now his subordinate. Other cops don’t like him much because of his job, but short-handedness means he gets pulled into a murder investigation anyway.